The following information was compiled from records at the Osage County Courthouse, April 1 through April 5, 2019. The following individuals were booked into the Osage County Jail in connection with charges or warrants as listed by the arresting agency. The following information was compiled from records at the Osage County Courthouse, March 25 through March 29, 2019. The following information was compiled from records at the Osage County Courthouse, March 18 through March 22, 2019. The following information was compiled from records at the Osage County Courthouse, March 11 through March 15, 2019. OSAGE CITY, Kan. – The Osage County Sheriff’s Office has reported that a driver of a pickup truck escaped injury after his vehicle was struck by a train this morning north of Osage City. The sheriff’s report said that at 9:29 a.m. March 21, 2019, a northbound Burlington Northern Santa Fe Railroad train struck an eastbound 1999 Ford F250 pickup truck pulling an empty livestock trailer, driven by Aaron Payne, 26, Scranton. The report said Payne failed to yield at a cross buck marked intersection at 201st Street and Auburn Road, in Osage County, about three miles north of Osage City. 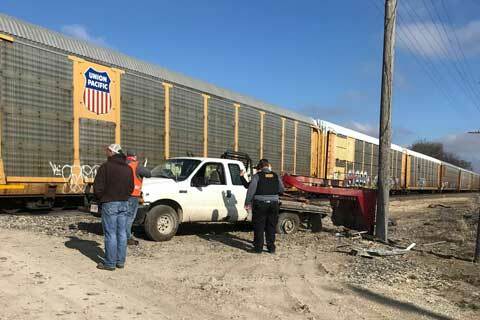 Neither Payne nor the train crew was injured, the sheriff reported. The train’s engineer was Sean McBreen and conductor was Dave Kleuskens. The accident is being investigated by the Osage County Sheriff’s Office. Assistance was by provided on the scene by Osage County EMS, Osage County Fire District No. 6 and the Kansas Highway Patrol. The following information was compiled from records at the Osage County Courthouse, March 4 through March 8, 2019. The Kansas Attorney General’s Office reported today that the U.S. Supreme Court has agreed to hear the appeal of James Kraig Kahler. An Osage County jury convicted Kahler of killing his two teenage daughters, his wife, and her grandmother at Burlingame, Kan., in 2009, and recommended he be sentenced to death. The Kansas Supreme Court affirmed Kahler’s conviction and death sentence in February 2018. Today the U.S. Supreme Court agreed to hear Kahler’s appeal from the Kansas Supreme Court decision. In his appeal to the Kansas Supreme Court, Kahler raised 10 issues, including allegations of misconduct by the prosecutor and trial judge, challenges to the instructions given to the jury, and an argument the death penalty is unconstitutional when applied to a person who has a severe mental illness at the time he or she committed a crime. The following information was compiled from records at the Osage County Courthouse, Feb. 25, 2019, through March 1, 2019. WICHITA, Kan. – A former emergency medical technician in Jackson County, Kan., was sentenced Tuesday to five years on federal probation for stealing morphine from vials, the U.S. Attorney’s Office has reported. Colby W. VanWagoner, 33, Mayetta, Kan., pleaded guilty to one count of obtaining a controlled substance by deception and one count of making a false statement during an investigation. One condition of his release is he not engage in any occupation that would give him access to controlled substances without prior approval from his probation officer. He also must complete an approved substance abuse program. The crimes took place while VanWagoner was working for the Jackson County Emergency Medical Service, in Holton, Kan. In his plea, VanWagoner admitted he tampered with vials of morphine sulfate. He replaced morphine with saline solution and put the vials back into narcotic boxes on ambulances and in office stocks. Tests showed the concentration of morphine in vials that had been tampered with was low as 1 percent or less. The concentration of morphine should have been 100 percent. The following information was compiled from records at the Osage County Courthouse, Feb. 11 through Feb. 15, 2019. The following information was compiled from records at the Osage County Courthouse, Feb. 4 through Feb. 8, 2019. The following information was compiled from records at the Osage County Courthouse, Jan. 28 through Feb. 1, 2019.